In 2016, we were blessed to spend two weeks in Colorado, one of my favorite places in the world. We are so lucky to visit there often, because my family owns a condo in Beaver Creek Resort near Vail. We spent a week in this area and then a week driving through Aspen, Telluride and southern Colorado over to Colorado Springs and up to Denver to fly home. One of the highlights of this trip — and perhaps my life — was a rare opportunity to see Pearl Jam perform live in one of the most amazing venues I’ve ever experienced. 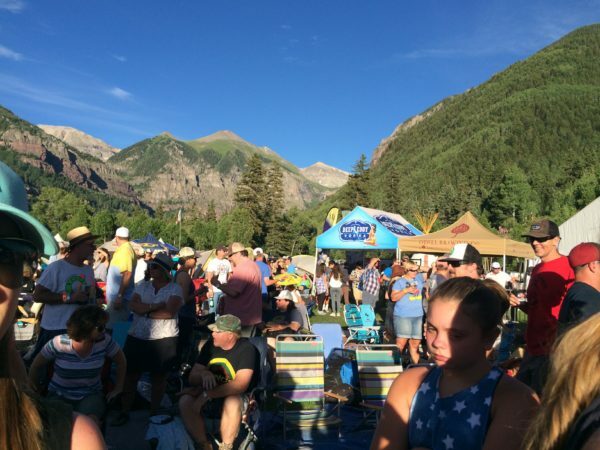 It just so happened that our three-day visit to Telluride (our first time in this most gorgeous of towns — more on that to come) coincided with the town’s annual RIDE Festival, a fairly new festival in a town that is known for year-round festivals, that brings rock bands to the area. It is named after TelluRIDE ;-). In researching the festival, my husband discovered Pearl Jam was the closing act Saturday night during our visit and subsequently about had a heart attack at the possibility of seeing this band in person :). I was able to secure a media pass, we purchased a ticket for him and our kiddos got in free – what a deal! 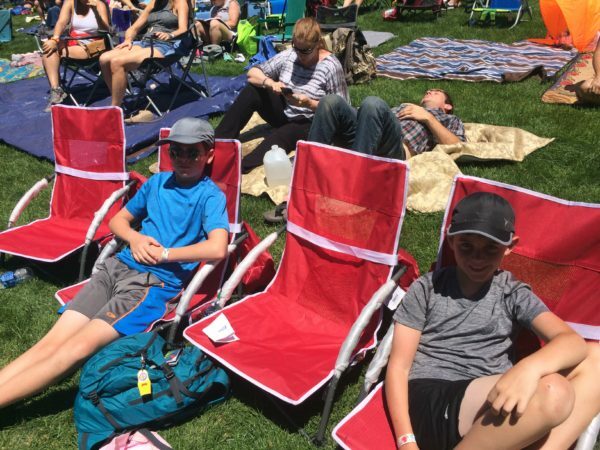 We spent one day at the festival, which was held in Telluride’s Town Park, a gorgeous park in a gorgeous town with mountains literally 360 degrees all around you. Plus, a few waterfalls also dotting the landscape – incredible – and a fantastic sunset between the mountains. 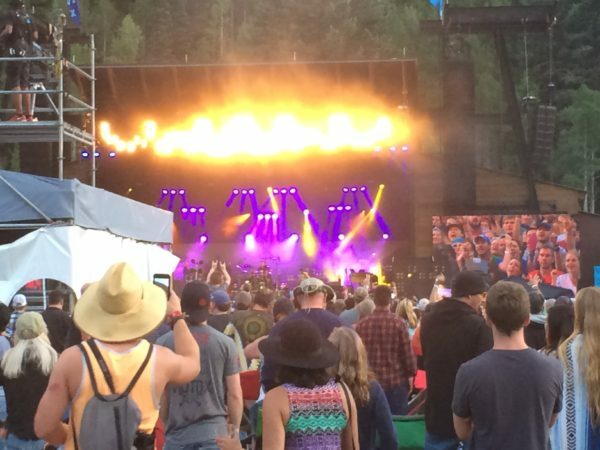 We saw several bands before Pearl Jam took the stage including Emmy-nominated Highly Suspect, the Dirty Knobs (with a former member of Tom Petty and the Heartbreakers), and Little Hurricane with their charming female drummer who served as a crush for many a male in attendance :). 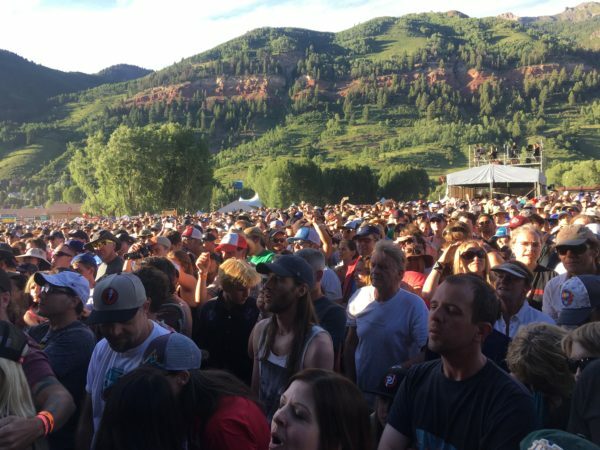 Seeing Pearl Jam in this very special venue in one of the most beautiful towns in the world was like nothing I’d ever experienced. I love to listen to a uniquely beautiful voice and I count Eddie Vedder’s voice among the tops of the best voices ever. 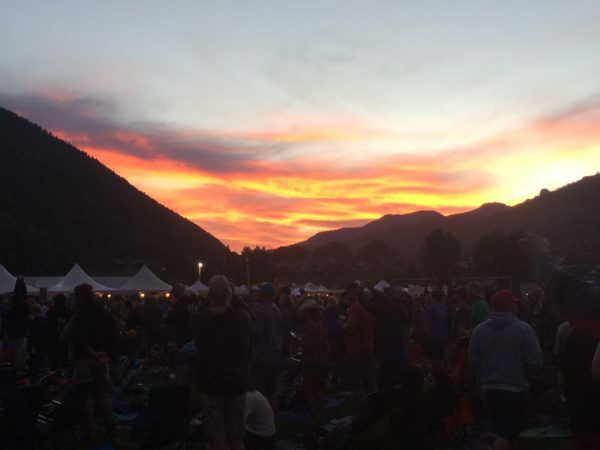 So to hear him sing live, in person, as the sun set behind the mountains was simply surreal. I thought I would melt away during “Just Breathe.” It was one of the moments that you want to capture forever and never let slip from your mind — a moment when everything comes together in such a way that you understand this beauty is not happenstance; it comes from something much bigger and greater than ourselves. Eddie Vedder was amazing. You could tell he was truly entranced by the venue and was in a lighthearted, fun and chatty mood. He talked quite a bit, sharing funny stories and tributes and pointing out the beauty of the setting in front of him and how clearly he could see the stars. My husband, who is a much longer and bigger fan of Pearl Jam than I, took the photo pass, which allowed us close access for photos for the first three Pearl Jam songs and got some of the amazing shots you see here. He is thrilled that he made eye contact with Eddie and that he’s now somewhere in Eddie’s brain ;-). 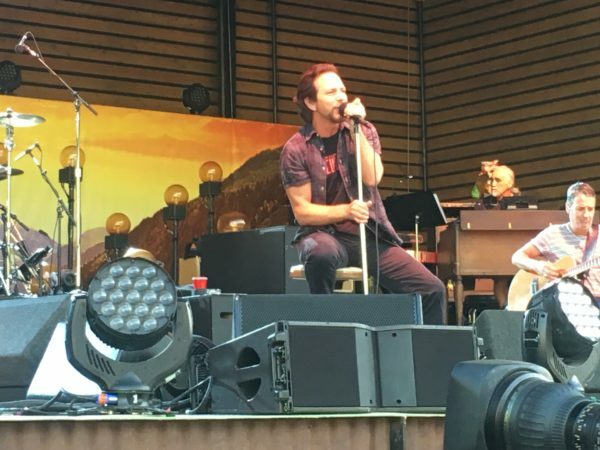 We heard from others who’ve attended past Pearl Jam shows that this was one of their best set lists ever — this from a band who changes their set list on a whim and depending on the setting. You never get the same show. 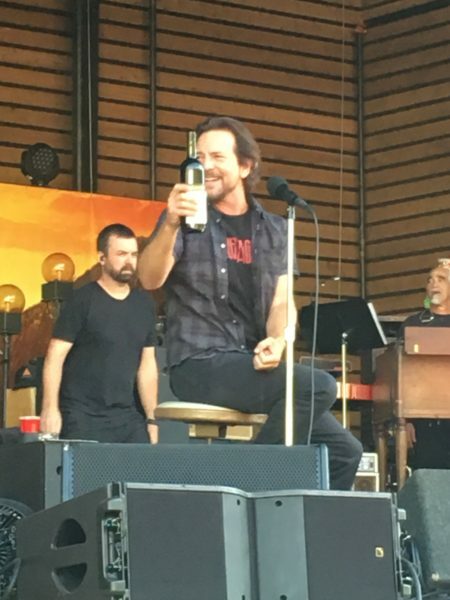 We heard “Alive,” “Even Flow,” “Angel” (the first time since 1994), “Daughter”, “Better Man,” a fabulous version of Pink Floyd’s “Comfortably Numb” and “Yellow Ledbetter” as a lullaby goodbye, according to Vedder (see the complete set list). I truly don’t think he wanted to stop playing. Colorado is such a beautiful state . The My son lives in Telluride (16 years now). He is a Ski Instructor, Instructor Trainer and PSIA examiner. He has written a bouldering guide to the area and is almost finished with a new version. I have been fortunate to spend considerable time there visiting him . It is truly a special place. When people ask him what it is like living there full time he’s says- his life is like your vacation ! Next time try the 4th of July week and parade- it is very unique. We also get to experience the “Telluride by the Sea” film festival here in Portsmouth, NH. He spends a great deal of time bouldering in Utah and of course here in NH- although he grew up on Long Island! I think he loves bouldering even more than skiing. It is a pretty special Place. The USAF does a flyover for the parade and then does it again in Ouray. It is quite a sight with them dying into the box canyon. My grandkids Love the hot springs in winter – with the snow on the surrounding mountains (although I do not take them to the clothing optional one ) and the Mine and the Ice climbing festival in Ouray is way cool to watch – although I am glad my son is no longer doing that. The Pitons are placed for rope climbing. My son does some of that- but he favors bouldering – done without equipment except for your fingers and strategically placed crash pads. Just dealing with the “miles” issue for he and his current GF to fly back here in a few weeks. United has a terrible schedule from Montrose now and only showing flights at 55K miles one way – yikes. Luckily American has added to their presence – although still too many miles required. The Telluride airport has been on and off for the past 5 years – but usually way expensive. I wish Southwest would add a hopper there int Denver. Allegiant actually added one for winter dates but then you have the bag charges for that portion. Keep sending us good info- enjoy reading it !